The American Medical College Application Service aka AMCAS will be the main application you will use when applying to allopathic (M.D.) medical schools in the United States. Well, there's a caveat to the rule about using AMCAS for all your M.D. applications. If you're from the great state of Texas, you have your own application service called Texas Medical and Dental School Application Service aka TMDSAS. Lastly, but not least if you are applying to osteopathic medical schools you will use American Association of Colleges of Osteopathic Medicine aka AACOMAS. No matter which medical school application service you decide to use there are some universal truths that all premeds must follow if they want to get into medical school. Today, I'm going to focus mainly on AMCAS since it's the most relevant one for premeds and you can just make the necessary changes were needed to your particular application service. Alright, with that housekeeping out the way let's get started. The golden rule to increase your chances of admission to medical school is to apply early. You want to be a position where you are ready to go with all of your materials in early June when AMCAS begins accepting applications for the upcoming cycle. To make sure you have a timely application you'll definitely want to review my medical school admission application outline that shows you what you need to do and when. 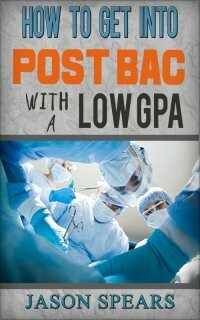 Enabling you to have your best chances of being admitted to medical school. Medical colleges use the American Medical Colleges Application Service because it streamlines the medical school admission process. Your AMCAS application is administered by the Association of American Medical Colleges (AAMC) and since 2001 AAMC has used a web-based application: Begin your AMCAS application. The work is not over once your application is submitted to the medical school application service of your choice. Completing your AMCAS application can be a hurdle in itself and you may have to ask first year medical students and your pre med advisors for help.There's no need to be shy about asking for assistance because your medical school future is on the line. Besides, even I a former premed society president got help with completing my application. There are about nine sections on the AMCAS application. They range from basic identifying information (name, birthdate, etc) to standardized test scores. Applying to medical school is not cheap. The processing fee for AMCAS which includes one medical school is currently $160 and for each additional medical school it costs $38. If you are facing a financial hardship you can apply directly to AMCAS for a fee waiver, although if you didn't get a waiver for the MCAT it may be difficult. Don't let the application fee prevent you from beginning your medical school application. You can start working on your application even if you don't have the money for the application fee. You just won't be able to submit your application to the individual medical schools until you pay. Try to come up with your money sooner than later because there are medical school application deadlines you don't want to miss. Not submitting your official transcripts can delay the processing of your application. You can begin submitting as early as mid May of each year. There will then be the process of transcript verification to compare all the grades from your official transcripts and academic record to those you supplied on your application. It will be noted if a grade correction was made, if credit was received, and a lot of other things. Basically, don't try to fool the system because you will get caught! You also can write a short paragraph on each extracurricular activity sharing your experience and how you were affected. Your letter of recommendation is a very important component of your application to medical school. My advice on obtaining letters of recommendation is very simple. Ask for recommendations several months in-advance of the deadline and only from individuals who can write STRONG letters on your behalf. UPDATE: now you can have individual LORS sent to specific schools of your choosing. In the past there was no way to earmark a LOR to a medical school of your choosing. What happened was your entire LOR file would be sent to the medical school. This may seem obvious, but here is where you will choose from a list of medical schools where you want to apply. You do not have to choose all of your medical schools at once. 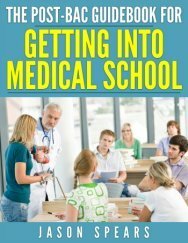 Do you need help in choosing medical schools? I have the perfect solution if you're unsure about how to choose medical schools. But always feel free to add additional schools as you see fit. You won't have to worry about applying to schools where the deadline has passed because those schools will be removed from the drop down menu within the application once the deadline has passed. Smart applicants will apply early and to a broad range of medical schools. This means applying to schools from all tiers. You don't want to put all your eggs in one basket because you never know what a particular medical school will be looking for in applicants. Your personal statement is roughly a one-page, typewritten, single-spaced essay where you need to address two questions. You are writing to show medical school admissions officers what you know of medicine, your life experiences, and why you deserve to become a physician. Remember you write only one medical school essay and it goes out to all the medical schools you apply to so take this writing very seriously! What's TMDSAS? It's the Texas Medical and Dental School Application Service (TMDSAS) which you will use to apply to professional schools located in Texas. If you are planning on attending one of the 17 accredited Canadian medical schools you'll apply using the Ontario Medical School Application Service aka OMSAS. Planning on attending an osteopathic medical school to receive your Doctor of Osteopathic Medicine (D.O.) degree? If yes, you will apply to osteopathic medical schools using the American Association of Colleges of Osteopathic Medicine Application Service (AACOMAS).